I don't have much to say today because I want you to check out something very important, and I hope my pro-life friends will carve an hour out of their busy schedules to hear this podcast. Theopologetics has some very powerful stuff to explain and defend the pro-life position. It comes from a Christian perspective, but the discussion and philosophies are not just, "The Bible says..." In fact, Bible texts are not a big part of the picture. You can listen online or download the show and listen to it on your MP3 player. Also, I hope you will forward this material to other pro-lifers so they will be better equipped to defend their positions. I have to say something personal. In some debates, we've been accused of appealing to emotion when we discuss the details or show pictures of aborted babies. What do people want? Of course it's an emotional issue! And as far as we're concerned, we're discussing life and defending unborn children, not blobs of tissue or that ridiculous phrase, "conceptus". We cannot act like people discussing the weather at a coffee klatch. Not when we think it's murder. And guess what? If I'm proven wrong scientifically, I would much rather be mistaken on the side of life. So, are you ready to give a listen? Click here for the material. Ironic thing: I had a duplicate of the image that I inserted, so I removed one. It was a creepy feeling when it said, "Do you wish to delete '20-week fetus'?" Buon giorno. It's Valentine's Day, and I bet you guys wish you were me! But never mind about that now. You know that I've gone on about how Christmas trees are being called "holiday trees" by the touchie-feelie politically correct crowd, even though it's not fooling anybody; we all know what those trees really are, and what they're for. When I was listening to Glenn Beck on the radio a few years ago, he was making "holiday tree" remarks that I thought were just great. Essentially, it ran like this: "We have our holiday tree. We keep it up all year. On President's Day, we hang dollar bills on it, and we decorate it for...", and he kept going with a few other humorous quips. I'm kind of tempted to do that myself, really do a "holiday tree" all year. That's right! One lady who works there was doing a real "holiday tree". As you can see, it's decorated for Valentine's Day. She gave me permission to take a picture so I can share it with the world. 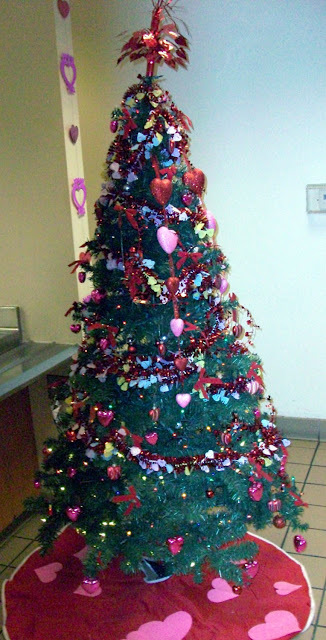 This tree will remain a "holiday tree" and become decorated for other holidays as well. "What's your point, Cowboy Bob?"